Tricyclic related antidepressants are quite similar to the tricyclic class of antidepressants and include tetracyclic antidepressants. Both tricyclics and related antidepressants like tetracyclics are part of the 'cyclic' antidepressants because of their ringed structures. Tricylic antidepressants are used to treat various mental health disorders such as depression. They work within the brain to affect several neurotransmitters. These neurotransmitters have functions ranging from regulation of mood to sleeping and eating. Tricylics work by preventing the reuptake of noradrenalin dopamine and serotonin into the brain's nerve cells. This is then thought to enhance mood and help depression. Tetracyclic antidepressants have a 4-ring rather than a 3-ring structure as seen in the tricyclics. These tricyclic related antidepressants also have a similar mechanism of action in relation to the tricyclic antidepressants. Generally, tetracyclics have more serious and common side effects than newer antidepressants such as selective serotonin reuptake inhibitors (SSRIs). If you experience many side effects, don't stop taking the antidepressant before consulting first with your doctor. An abrupt discontinuation of the drug can leave you suffering from withdrawal effects and your depressive symptoms may also intensify. Many people begin to feel better shortly after beginning antidepressant therapy with tetracyclics. It can, however, take 4-8 weeks for you to feel the full benefits of antidepressant treatment for your depression. What Type Of Tetracyclics Will My Doctor Prescribe? 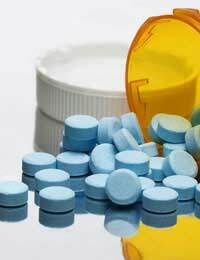 Trazodone is considered in some instances to be a modified tetracyclic although other medical professionals do consider it in a class of its own. It is particularly helpful for treating anxiety that may occur as a symptom of depression. Tricyclic related antidepressants such as the tetracyclics are only one of many antidepressant types that are successful for treating depression. If you are given a prescription for a tetracyclic antidepressant and find that the side effects are too bothersome, your doctor may reduce the dosage or recommend another tetracyclic. You may also be given an antidepressant from a different class. Overall, antidepressants are effective for treating depressive symptoms and can help you to get back to feeling better and more positive each day.